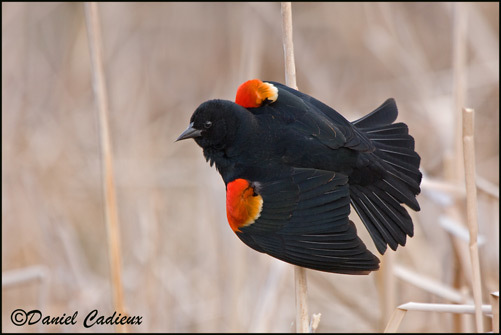 The Red-winged Blackbird lives in an extremely diverse and organism rich environment; a marsh or wetland area. These areas not only contain hundreds of different animal species, but also are home to literally thousands of plant species! So as you can see, in this environment, these birds are always interacting with other organisms. Among other animals in the marsh environment, the snapping turtle is one of the most dangerous land creatures that the Red-winged Blackbird could come into contact with in its wetland setting. Along with the snapping turtle, these birds interact with multiple organisms on a daily basis such as: dandelions, cattails, whitetail deer, salamanders, and butterflies. They also come into contact with several different kinds of flowers, for example, many different kinds of daisies. Visit the 'fun facts' page to learn some more cool stuff about me, but don't forget to check out the author page before you leave!